Many, many, many people have been coming to me, grateful for the work I do here on the site, and asking for a way to donate to Neon Revolt. I’m very grateful for the continued generosity of my readers, and as the site grows, frankly, I could use the extra help to keep it running. 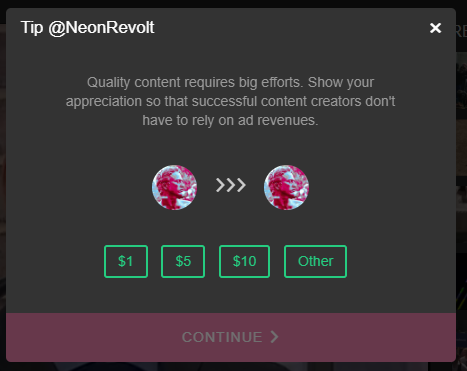 One day I’ll be independently wealthy, and able to subsidize the cost of running a site that reaches, quite literally, MILLIONS of people, but right now, Neon Revolt is dependent on donations from its readers. So on this page, I’m going to go over two ways you can donate to Neon Revolt right now (and I’ll hopefully be adding a third way in the future). Just to be clear, however, donating to Neon Revolt does not get you access to privileged, or exclusive content. ALL content on the site remains free for all users, regardless of whether you donate or not. Everyone always sees the same info. Yes! Thankfully, I am finally able to use SubscribeStar! Think of it as a Free-speech Patreon Alternative. It’s utilized by some really big, reputable names already, like Stefan Molyneux, Dave Cullen, Sargon of Akkad, and Tim Poole, and I’m happy to say I’m able to use it now, too. Tiers start at $1.99 a month, so if you think my work is worth the price of a gas station coffee and want to support my ongoing efforts, I would gratefully accept your support. Subscribe to NeonRevolt for more updates and exclusive content. I’m a BIG fan of cryptocurrencies, as they allow individuals to bypass antagonistic gatekeepers, and send funds to whomever they please, very quickly and very cheaply. To keep it simple, I’m allowing people to donate whatever amount Ethereum they’d like, as opposed to adding a ton of different crypto options. I could add a ton of different cryptos here, but I’m assuming that if you’re smart enough to buy Bitcoin or other cryptos, you’re smart enough to use Ethereum. If you want to buy Ethereum to donate, you can always use a service like Coinbase.com. This is a one-time-donation (obviously), as opposed to the recurring monthly subscription available through Gab. All you have to do click the button below, and it will open up an address and scannable QR code. Gab donations have been down since late last year, unfortunately. I’m hoping they return at some point, but as of right now, they are defunct for now. Right now, the primary way I ask readers to donate is through Gab. This creates a recurring donation (set at $1.99 a month) and works in a way very similar to Patreon. All you have to do is click the big neon pink “subscribe” on my gab account (pictured below), enter in your information, and boom! You’ve sent two bucks my way, for as long as you want to let that go. And you can cancel any time! This isn’t like one of those CD clubs, where you’re roped in forever. You are in total control, at all times. This is currently the easiest way to donate right now, and it costs less than a Dunkin’ Donuts coffee and it’s better for your brain (and the nation/world), and cheaper on your wallet than Netflix! And don’t feel bad if you think it’s too little (and I have had quite a few people say this to me). I wanted it to be accessible to pretty much everyone, an believe me, it all adds up and goes a very long way to supporting the site. Previously, I was a bit stumped as to how to approach this, given all the issues with censorship in this space, but today, I actually discovered a way for people to make one-time donations through Gab, through their Tipping system! 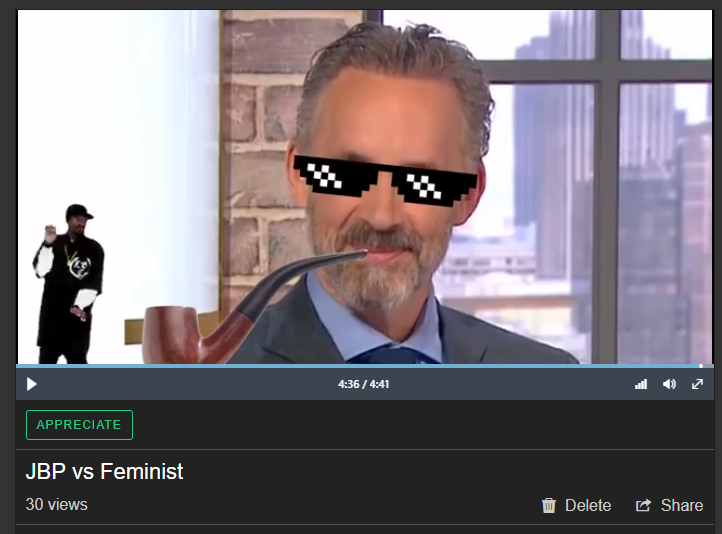 So if you want to make a one-time donation to Neon Revolt, what you actually have to do is tip one of my videos on Gab. Click “Appreciate,” which in the screenshot above, is right underneath the play button, and Snoop Dog. This little window will pop up, allowing you to donate however much you want. I’m thrilled I was made aware of this, because before today, I thought I was stuck on this front. Granted, it’s a bit out-of-the-way, but at least there’s an easy-to-use, working solution, now! I thank you all in advance for whatever you choose to donate to the site. I’m blown away by the generosity of my readers, and will continue to put my best efforts forward into making the site as great and as useful as it can be. I can tell you from the booming traffic stats alone, that there is a profound hunger for the kind of information I’m curating here, and we’re really making a difference in the world, as news spreads and catches on, and more people become redpilled. This wouldn’t be possible without your donations, and you are sincerely appreciated.